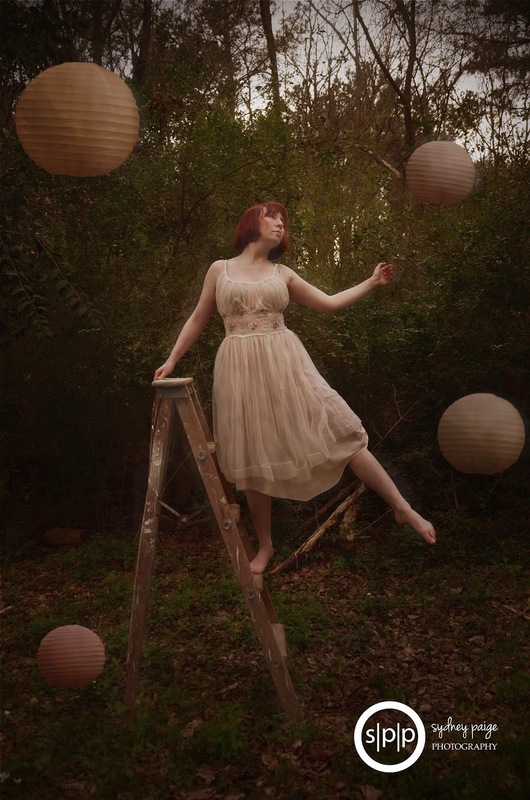 One of my goals this year was to focus on one Fine Art/Conceptual photography session a month. I did this one back in March with my lovely and talented muse, Savanna. But due to being just plain busy and the fact I felt the photo was ‘missing’ something, I haven’t posted it yet. I found out what it was missing earlier this week and finished one of my favorite photos in my Fine Art/Conceptual photography portfolio. This photo in particular really means a lot to me. Before I started shooting I had told Savanna and my Husband, Cody, what this photo was about. Cody was a little weirded out to be honest…or maybe he was just being shy. Ha! He was like you are dedicating a photo to me? That neither of us are in? What does that even mean? So I had to explain to him what the concept was – then he got curious. In this photograph, Savanna represents me. How I am always making these crazy goals for myself, dreaming big and just all my insanity (hence the floating lanterns). Cody is represented by the ladder. How he is always holding me up, balanced and pushing me higher – allowing me to go higher. No matter how worn or exhausted he is, he is always telling me to go for it and propelling me upward – still while keeping me steady. So, here is ‘Balanced Insanity’. Dedicated to my Husband, Cody. Thank you Savanna for always helping me to capture my imagination. Thank you Cody for making sure I always have one. I love you.